Have you ever heard the term "play" when speaking with your repair technician? They may have mentioned that the mechanism had a little "play" in it -- which actually is not always a bad thing. But, what exactly does this mean? Flute finisher Karl Kornfeld discussed this term with us as it applies to flute repair. He explained that play usually refers to lateral movement of keys within a section or of an entire section (of the mechanism). 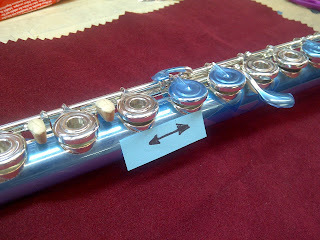 Depending on which key or section, a small amount of play may be necessary for proper function. Play can be caused by normal wear and tear, loose or poorly-fit screws, or damaged posts. 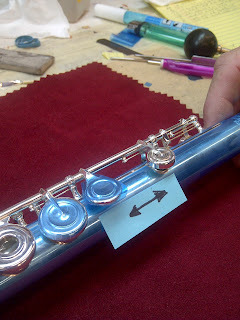 Different flute types (for example - pinned or pinless) have different rules regarding how much and where play is acceptable. Excessive play -- especially to the point of rattling -- is definitely not good. If you think there might be excessive play in your flute's mechanism, make sure to take it to your technician for proper evaluation. Arrows indicate the lateral motion of "play"